Macro-cracks on the surface of articular cartilage are one of the hallmarks of early osteoarthritis and joint damage initiation. Macro-cracks negatively affect cartilage mechanobiology and load bearing capacity. The aim of this study was to quantify the changes in transient and steady-state force response of healthy cartilage in the presence of macro-cracks when compressed. Ten macro-cracks were created on the surface of intact articular cartilage. The force–time responses of intact cartilage and cartilage with macro-cracks (n = 22) were compared for multiple nominal axial compressive strain levels and strain rates. 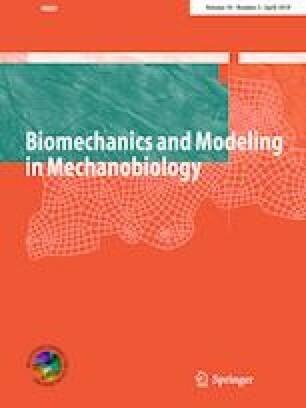 Experiments were simulated using a fiber-reinforced biphasic finite element model to gain insight into the possible mechanisms contributing to changes in the mechanical response of articular cartilage when introducing macro-cracks. We found a significant reduction in the transient and steady-state load bearing capacity of cartilage samples following the introduction of macro-cracks. Two mechanisms were identified as potential causes of this reduction: (1) an increase in permeability and associated decrease in fluid pressure, and (2) damage of the structural integrity of the solid matrix. The first cause was predicted by the finite element model, while the second cause was not. This work was supported by the Eyes High Postdoctoral Scholarship offered through the University of Calgary, The Canadian Institutes of Health Research (Grant No. FDN-143341) through a Foundation Scheme Grant, The Canada Research Chair Program (Grant No. 950-230603), and the Killam Memorial Chair for Interdisciplinary Research at the University of Calgary (Grant No. 150303).